Nice memories of a weekend away on the country side in Viscri. Most of us arrived on Friday in the late afternoon, getting to know each other around the dining table. Perfect start of the weekend. Viscri is a small village in Transylvania, which got famous thanks to Prince Charles who bought here some property years ago. 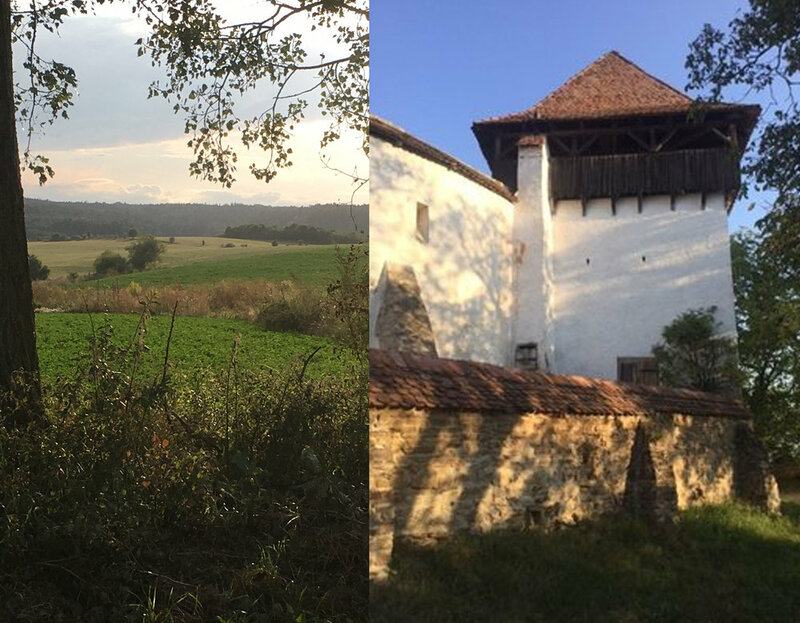 While more and more guest houses are opening, the fortified church stays the main attraction in the village. On your way to the church you will find small colorful stands in front of the houses where the locals are selling some handcraft work. Difficult to resist when you see a selection of home made jams, local honey, slippers in felt for the cold winter months. Getting up early in the morning gives you the opportunity to enjoy the village before the tourists arrive, you will only meet the cows going to the meadow, ducks and chickens running around on the streets. Silence...... only the birds will accompany you on your walk. 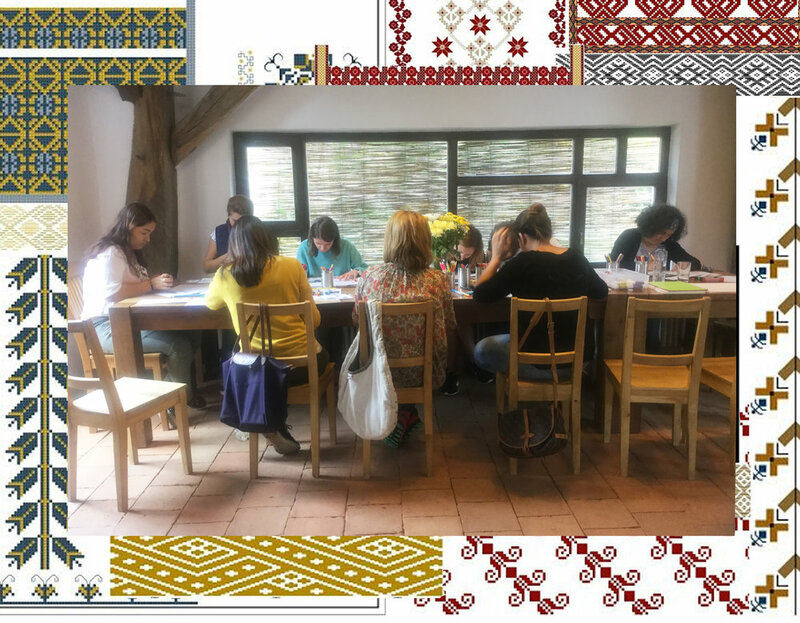 We were ready to start the workshop after a healthy breakfast with local products, this year I wanted to go one step further with the Romanian traditional motifs and Matisse' painting: The Romanian Blouse was the perfect combination. 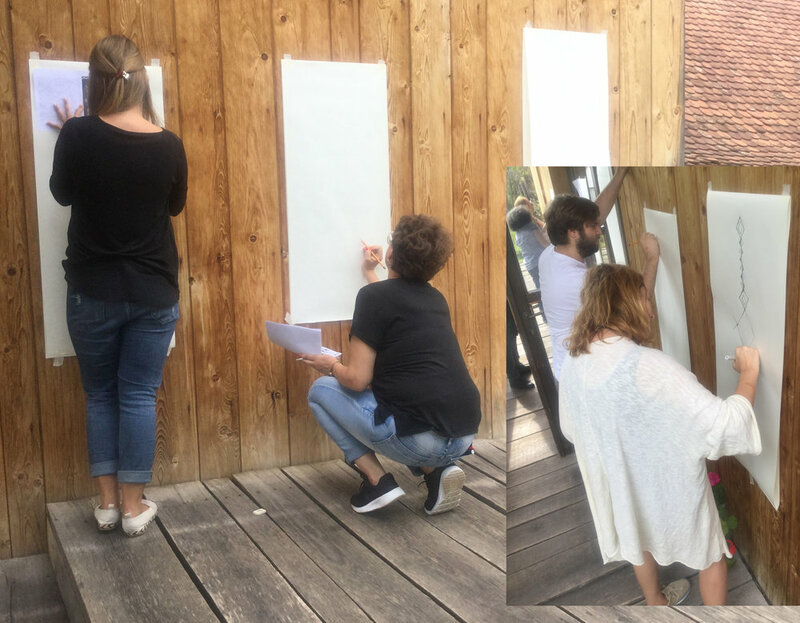 First task: decorate the facade of a country side house. Everybody wants something else: some want protection, others prosperity, others want a lot of children. A rooster will keep the evil spirits away, the wheat as a symbol for prosperity, the eyes, window of the soul. So when decorating your house choose well. 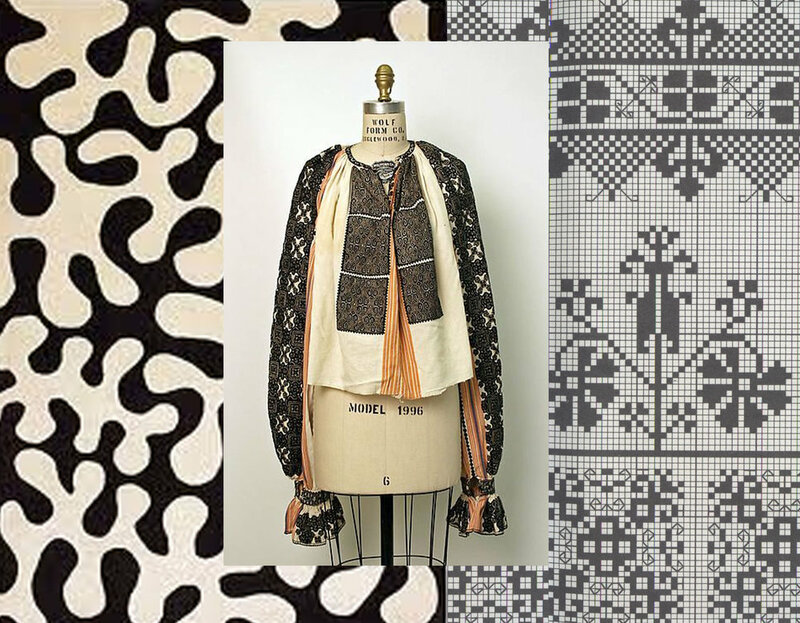 Matisse made a series of painting inspired on the Romanian blouse, ia. He met the Romanian painter Theodor Pallady while studying at the art academy in Paris. 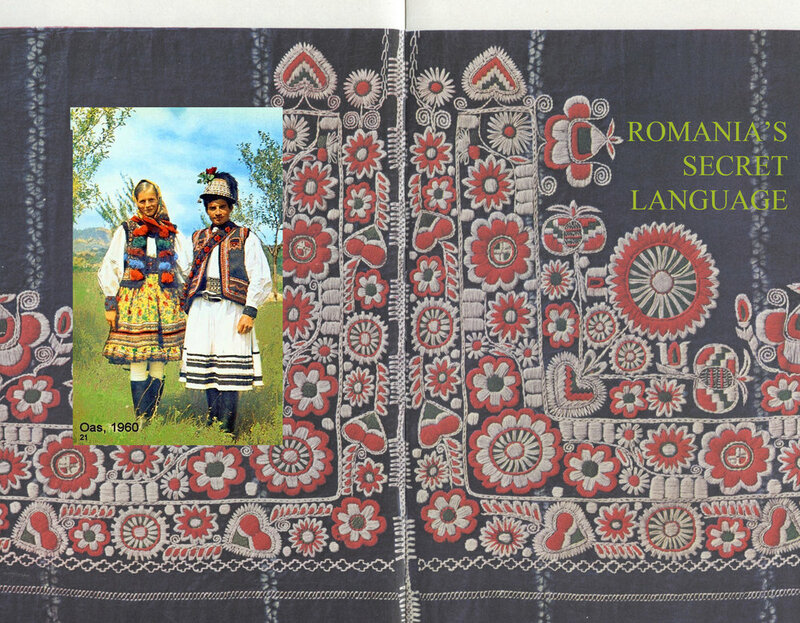 Matisse discussed his drawings and painting of the Romanian Blouse, which he made during the 2nd world war, with Pallady via letters. Matisse lived at that time in the South of France. 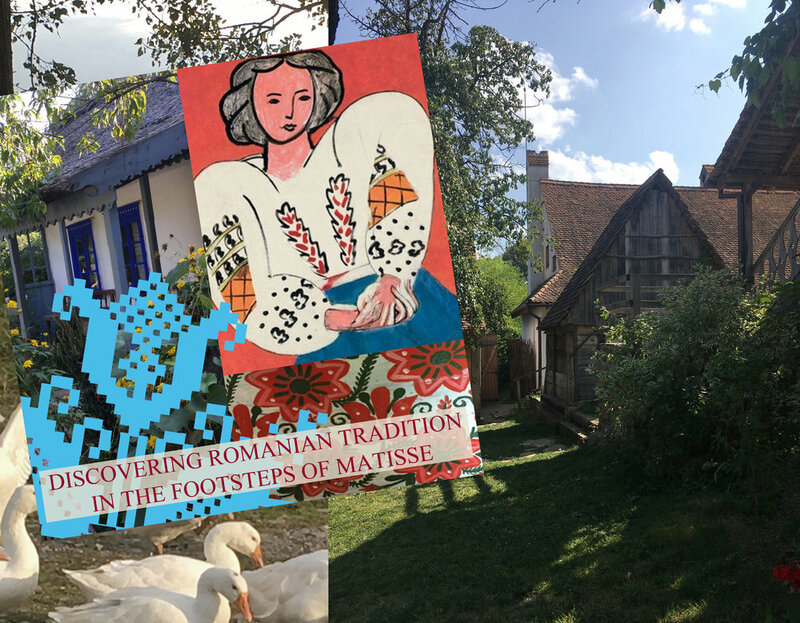 Matisse, the leader of Fauvism, was giving us some extra inspiration: not only the paintings of the Romanian Blouse, but also his way of painting. 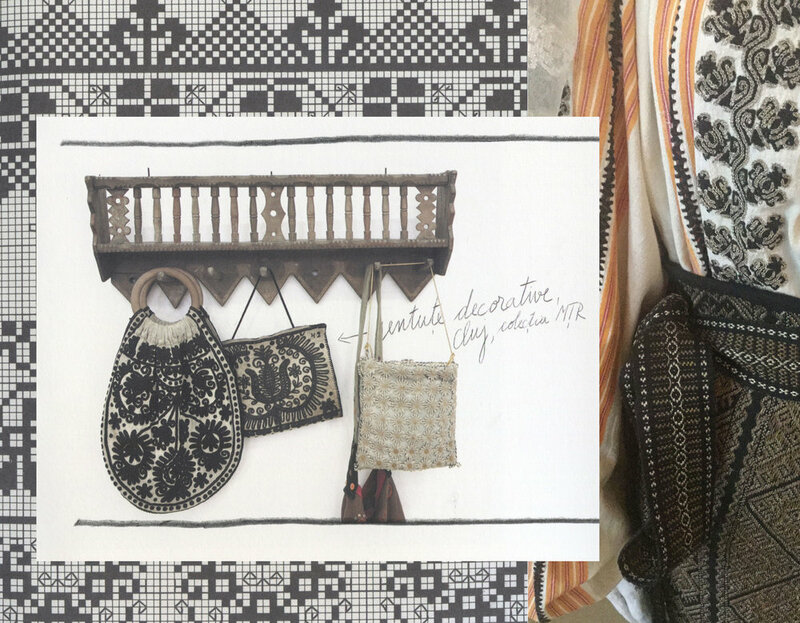 And so we discovered that combining Romanian tradition with stronger colors, and contemporary furniture would just bring the perfect modern touch to the traditional Romanian design. Once you start taking something out of his context, blow up the designs, or use strong colors you can get some very modern results. 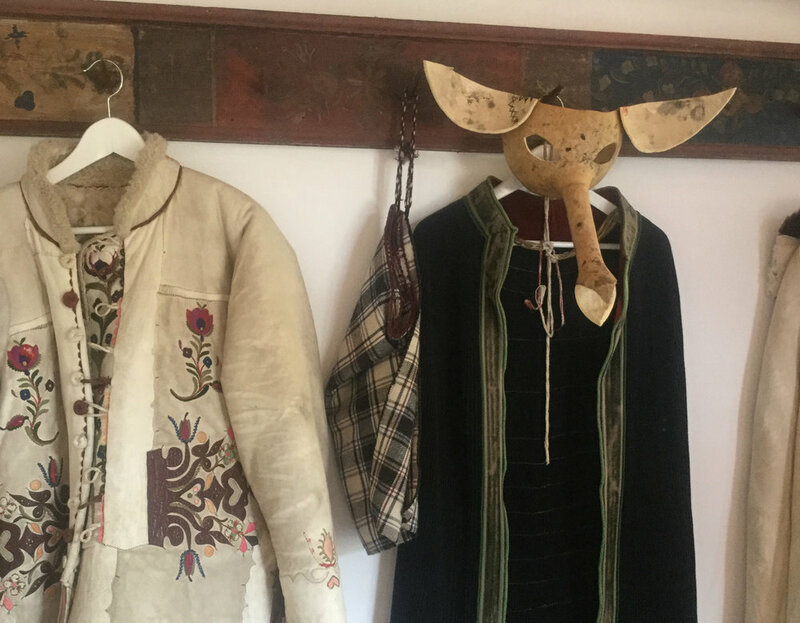 Every time I go to Viscri, even just for the weekend, I feel as energized for the next weeks as I would have been on a long holiday. We all worked hard, at the long table in the barn, or enjoying the fresh country side air in the back yard. Being in such a typical village helps a lot to get inspired. Looking in magazines, combining images and the result was sometimes surprising. 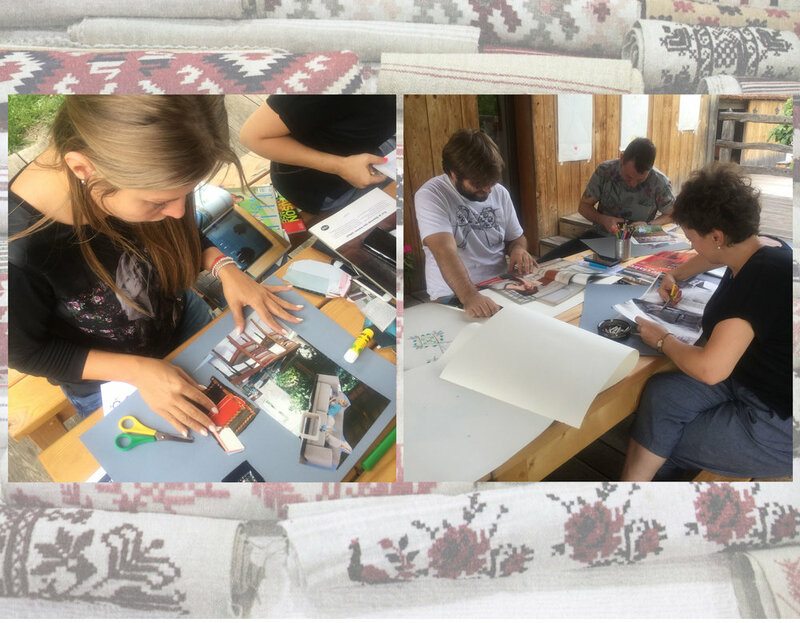 In the afternoon we started with something completely different: we looked at a Romanian motif, keept in mind the free hand of Matisse and everybody had fun drawing their own wallpaper. Time for this task was limited, which made that it had to be spontaneous. On Sunday morning we took another direction and we would study small spaces. 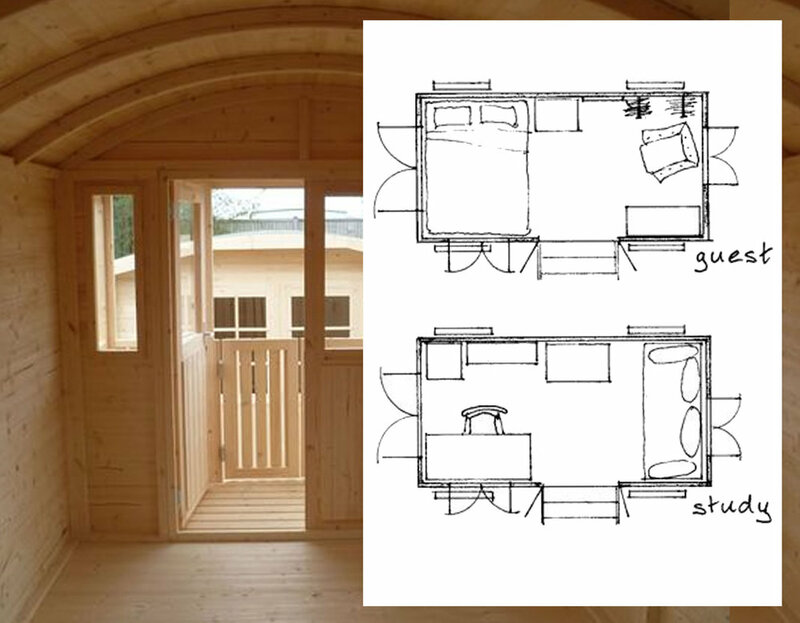 Making the floor plan for a vardo, a gypsies wagon, of the 2 x 4 meter would be the challenge of the day. Having such a wagon in the back yard is getting quite trendy. First task was to think what you wanted to do with your wagon, and than to see how you would get all the furniture in this tiny space. It could be an extra guest house, a summer house for the children. I would love to have a small office like that to work in with a view on the nature around. 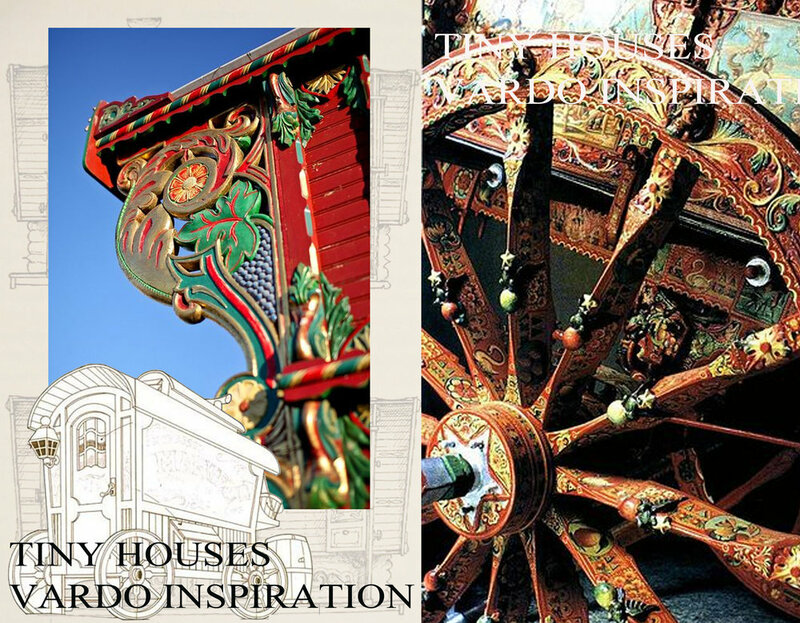 The gypsies style was a perfect inspiration to decorate this wagon in a bohemian style. The weekend was creative and colorful. 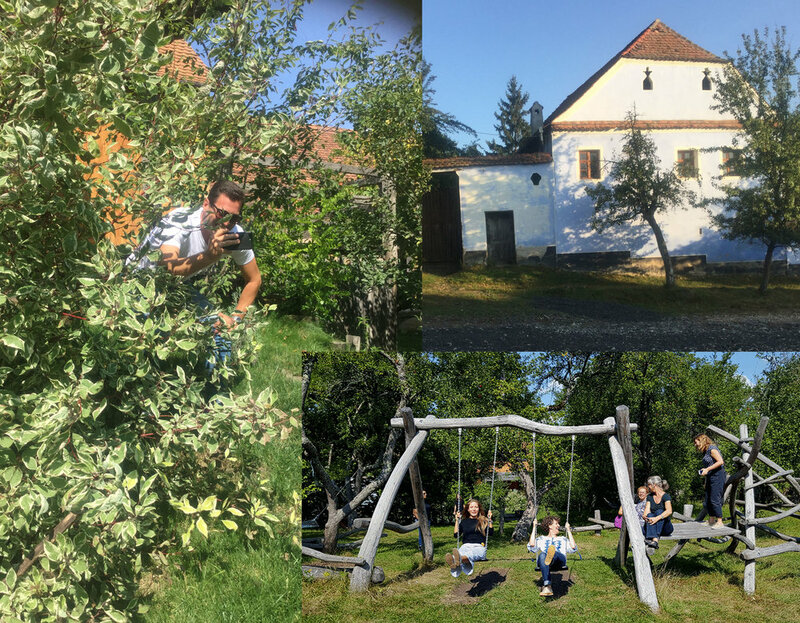 We couldn't just leave Viscri before taking a relaxing break and have some fun in the back yard of Viscri 125. You got inspired and you want to join us next year? A simple click, on the Like button of my FB page, and you are sure not to miss any of my blog post. Or follow me on Bloglovin' And you will be the first to know when the next one will take place.